Hey there! My husband and I (along with our dog, Teddy) have finally made the move into our new home and we’ve been slowly unpacking, setting up, and purchasing furniture and home things over the last couple of weeks. Fun, stressful, and hopefully still on a budget. Anyway, today’s new recipe is a simple and healthy salad that tastes amazing, comes together quickly, and makes a generous amount (8 cups) that’s perfect for meal prep or serve at a family and friends gathering. 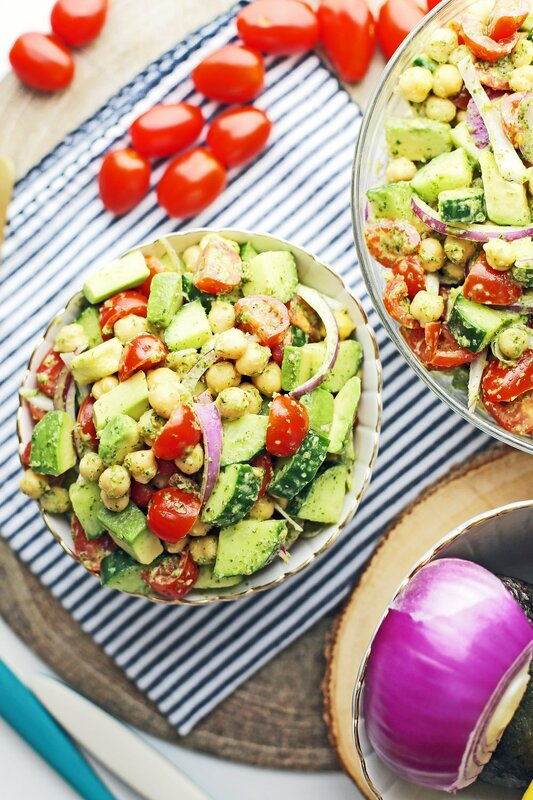 I hope you enjoy this recipe for Chickpea Cucumber Avocado Salad with Parsley Dressing! This recipe uses chickpeas (aka garbanzo beans), which have a mild nutty flavour, slightly grainy (but pleasant) texture, and are a good source of fiber and protein. I used chickpeas from a can for convenience as it’s already cooked and just needs to be rinsed with cold water and drained. Creamy avocado is full of healthy fats (that help you stay full) and a good source of vitamins C, K, and E as well as other nutrients. I used the common Hass variety, which has dark green-colored, bumpy skin, creamy greenish-yellow insides, and round brown pit (seed). Use a ripe avocado for this salad: You can tell when it’s ripe when the avocado yields to gentle, but firm pressure (the avocado is soft, but not mushy). Use a knife to slice the center lengthwise around the pit and use both hands to twist the halves apart. Then remove the pit by carefully whacking the knife into the pit and twisting it out or use a spoon to pop the pit out. Slice each halve in half and using your hands, peel the skin off (it should come off easily if the avocado is ripe). Chop the avocado into pieces. Then good-for-you juicy sweet-acidic grape tomatoes, crunchy vegetal sweet English cucumber, and spicy red onions add pleasing, fresh flavours and colours to this easy salad recipe. A complementary simple, six-ingredient parsley dressing is mixed into this salad, which has bright flavours due to the fresh green mild notes of curly parsley, zesty fresh lemon, and bite from garlic cloves that’s combined with fruity extra virgin olive oil and seasoned with salt and pepper. This recipe makes ½ cup of tasty dressing. All of it will be used in this recipe. I used an immersion blender to combine all the ingredients together. A regular blender can also be used too. Healthy and full of fresh and colourful ingredients! Texture-rich: Creamy, tender, and crunchy ingredients in this dish! Quick and easy to make: This salad is uncomplicated, has few ingredients, and is simple to prepare. A delicious overnight salad: This make-ahead salad tastes even better the next day (the flavours mingle together), but is also delicious to eat right away. It can be eaten up to four days. A wonderful light meal or a side dish that’s perfect for meal prep, potlucks, and picnics. Can easily be halved to make less or scaled up to make more. Looking for more spring and summer salads? Check out these four! Did you try this salad recipe? If you did, please leave me a rating and comment down below or tag me on any of my social media. I’m @yay_for_food on Instagram. I’d love a picture! Place all the dressing ingredients in a high-powered blender (or use an immersion blender) and blend until ingredients are well-combined. Taste and adjust the dressing to your preference. 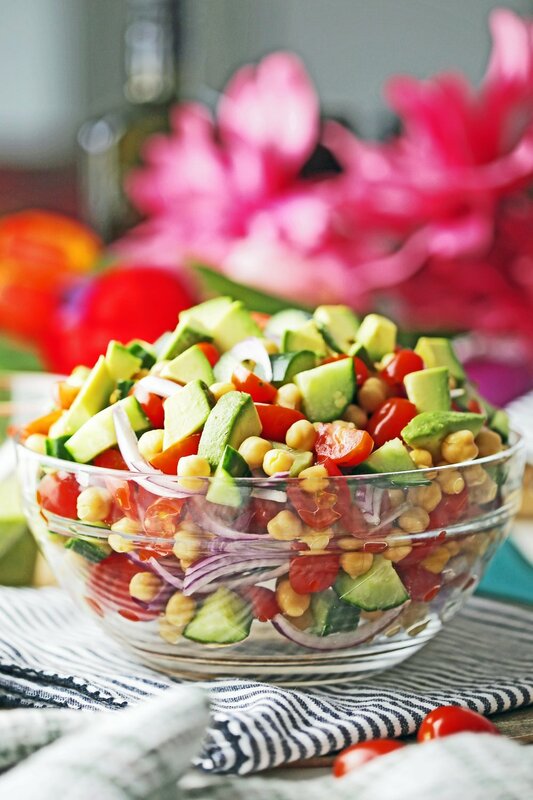 In a large bowl, combine the salad ingredients, then drizzle the dressing on top. Toss to combine. Can be served immediately, but best to cover and refrigerate for at least 2 hours or overnight to allow flavours to marry. Toss again before serving. Can be kept for up to 4 days. Cover tightly and store in the refrigerator.